Communion is a precious time in the life of a believer when he is focused on remembering and giving thanks for the sacrifice of Jesus Christ on the cross. This time is also known as the Lord’s Supper. Since Communion is a shared experience with fellow believers the word Communion is a good descriptive word for the activity. In some churches this celebration of the Lord’s Supper is called the Eucharist which means to give thanks for the elements as Christ did at the original Lord’s Supper celebration. The gospel accounts of the Lords Supper talk about the events surrounding the celebration (Matthew 26:26-29; Mark 14:17-25; Luke 22:7-22; and John 13:21-30). In 1 Corinthians 11 Paul the Apostle gives instructions on preparing for and taking Communion. He starts out by explaining that Communion is a sacred time and that it should not be considered a lighthearted event (vs. 18-22). The focus of Communion is to remember the Lord and thank Him for His sacrifice. It is not a normal meal where the focus is on the food. What Paul says in these verses about not taking the Lord’s Supper unworthily is reason for us to consider taking proper preparations before the celebration of Communion. While this is not a sad event in the life of a believer it is also not a time for frivolity. It should be a serious time in the church. What Paul says about not taking the Lord’s Supper unworthily is reason for us to consider taking proper preparations before the celebration of Communion. The actual details of Communion change from church to church since there is very little said in the Bible of exactly how it is to be done. However, what is common is that there is a communal taking of the elements which are typically unleavened bread and grape juice. This information comes from the gospel accounts of the Lord’s Supper mentioned above. The unleavened bread represents the body of Christ. It is unleavened because in the Bible leaven is a picture of sin. Jesus took the bread, prayed over it, brake it and shared it with His disciples telling them to remember Him when they took Communion with one another. 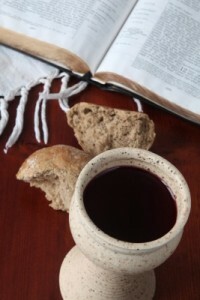 Though the Bible speaks of wine as the liquid that was consumed during the Lord’s Supper, many churches use grape juice. The word for wine in Greek is the same word that would be used for grape juice. And, as grape juice is a non-fermented (unleavened) version of wine, many churches feel it is more in keeping with the idea of unleavened bread. Jesus too took the juice which represented His blood, blessed it and shared it with His disciples. The passage which deals with the Lord’s Supper in 1 Corinthians gives a little more insight into what our attitude should be during Communion. Paul mentions that the Lord’s Supper should not be taken unworthily. This is new insight that is not included in the gospel accounts. There are many explanations as to what Paul meant by this, but they all center around taking Communion with a clear conscience before God and remembering the great sacrifice of Christ for our salvation. When preparing to take the Lord’s Supper we need to confess our sin to the Lord. Take time before the Communion service and examine your life to make sure there is nothing hindering your fellowship with God. Communion is a celebration for Christians. Therefore, ensure that you are a child of God. Have you accepted Christ as your Savior? If you know you are saved, then participating in the Lord’s Supper is an appropriate activity. If you are not saved, then please take care of that today. Visit our page on coming to the Lord and contact us if you have any questions about salvation. Though you are saved, you may still have unconfessed sin in your life. You should deal with that before the Communion service. Christians have been forgiven by God from the punishment of their sins. However, not acknowledging your sin and confessing it to God will cause a lack of fellowship between you and the Lord. Beyond causing you to feel less connected with the Lord, living with unconfessed sin goes against Paul’s warning of taking the Lord’s Supper unworthily. Christ sacrificed His life for your salvation. You acknowledged that when you got saved. It is honoring to Him and His sacrifice when you confess your sin and keep a clean account with God. Now that you have confessed your sin, you can participate in the Lord’s Supper with thanksgiving. Jesus thanked God for the elements they were about to receive. At the time the disciples did not seem to understand everything that this special meal with their Lord meant, but they could see that Jesus Himself was thankful to God for the upcoming events. Jesus knew what His death would bring to His followers. Today we can take Communion with thanksgiving. While it is a serious time of personal reflection, it should also be a time of great joy and thanks to God. Again, that is where the term Eucharist comes from. It is from the New Testament Greek word that means thanksgiving or gratitude. This gratitude should still be a serious time according to Paul in 1 Corinthians but it doesn’t have to be a sad time. As mentioned are many variations to the details of the Lord’s Supper. Your church may celebrate it very differently from another church while still being biblically appropriate. What should be common though is that Communion is a serious time of reflection and thanksgiving. What Does Good Friday Mean To Me? David Peach has been in full time missions work with the Deaf since 1994. He has started several deaf ministries in various countries and established a deaf church in Mexico. David now works as Director of Deaf Ministries for his mission board. David has written 207 articles on What Christians Want To Know! Read them in the archive below. Some nice points, but what about community? It seems like Communion should be about a community of believers transformed by what God has done, is doing, and will do, right? Joshua, I think community is an important aspect of Communion. I thought about dealing with that part of it, but that seems to be more about the structure and doctrine of Communion more than the personal preparation aspect of Communion. I would not be surprised if Jack writes an article dealing with the doctrinal structure of Communion sometime soon. That is the type of article he tends to write. This was a very good presentation of communion David. I am glad you included 1 Corinthians in your article. Communion without a clear conscience puts a rift between us and God. Thank you Derek. When I think about preparing for Communion that is the passage my mind always goes to. I really look forward to this ordinance of the church and I agree that thanksgiving should be a key part of partaking. Christ said, “to do this in remembrance of me” – He knew that as people we are prone to forget. Where I worship, we celebrate communion once a month. A week prior to coming to the table, our church elders remind the congregation so that we can start to think on and prepare our hearts for communion. That week prior for me is a great time to confess sins and to meditate on the cross and salvation – a salvation sealed in the blood of the King! Jeff, thank you for your comment. Every church I have been part of has made a big point to let people know when Communion would be celebrated. This gives the participants an opportunity to prepare their hearts. I think a church or pastor makes a mistake when Communion either becomes so commonplace that it is not special, or they have it so rarely that people don’t know how to properly prepare. Thank you for your insight. David, I want to be sure that I am prepared completely 100 % ready to partake communion. Ia m saved but I know I sin everyday. Can you please help me understand, teach me so I can sure I am prepared and honor God receive the Lords supper please? Thank you for your question Rick. The biggest thing is to have a clear conscience before God. The beautiful thing about God’s promise to forgive us is that He gave this even before we sinned. 1 John 1:9 is a beautiful promise that if we confess, He will forgive. Confess means to say the same thing about our sin as God says. Or another way to say it is to be in agreement with God about sin. This didn’t make much sense to me when I first heard someone say that. But it basically means that you should take the same view of sin as God takes. Our sin is repulsive to God. But what is our view? Do we accept it as part of life? Or do we also find it repulsive? When we truly confess our sins then we will see sin as God does. Then the promise is that He will forgive. Here’s the strange thing: He has already forgiven us. From His perspective all our sins were in the future when Jesus died on the cross. When we accepted Jesus as Savior we had past sins and future sins, but they were all forgiven at that time. God has forgiven all. But from our perspective, things are different. When we sin, our desire to be close to God begins to change. God didn’t move away from us, we moved away from Him. God is there waiting for us to come back to Him in fellowship. That is where a clear conscience comes in. Paul tells us in the Corinthians passage that we should examine ourselves for the purpose of confessing sins and respecting the great sacrifice that Christ offered for us. I hope this helps Rick. Spend time in confessing sin and having a clear conscience before the Lord. This does not mean you will never sin again, but your attitude toward sin should be very different. Rick, I am sorry but I don’t really know what you mean when you use the word ‘deliverance.’ It seems like you are asking something specific, but it is a term I am not aware has a specific meaning from a biblical perspective. In the Mystical City of God book, in the section of The Transfixion, and under “The Words OF The Queen”‘ it talks about it being a horrible crime in the eyes of the Lord that men should despise and neglect the frequent reception of the Holy Communion, and they should approach it without preparation and fervent devotion. After reading this and what you wrote, and am guilty of not preparing myself before Holy Communion, but will start this week doing a better job. Have you read this book and passage, and what was your thoughts and suggestion. Hello JeffL. This is not my article but in my humble opinion, since you show repentance in this and are obviously sorry, I think you should be fine. I think that those who never take Communion seriously are in more trouble. You seem sensitive to not wanting to offend God and that shows me that your heart is not hardened. Also, in this book, The Mystical City of God book, you should never take anything outside of the Bible of concern for only the things written in the Bible are those things that we should judge ourselves against and not a manmade or man written book. Does this help sir? Thankyou Father, Lord & Holy Spirit, for everything You have, are and will be doing, amen. Hi.. If I committed sin through out the week and on Sunday the church will be having the holy communion and I confess my sins and prepare for sunday.. Can I part take in the holy communion? Hello Leo. Thank you for your question sir. I believe we need to confess our sins immediately and come to communion with a clean heart and then you can partake in communion with no problem with your conscience before God. I hope this has helped sir. Please don’t wait until Sunday to confess your sins. Do it immediately.